Diana learned to surf more than 15 years ago in San Diego, and she’s been riding waves (in the ocean or on the RipSurfer X!) ever since. As a surfer and former competitive gymnast, acrobatic performer, and gymnastics coach, her fitness focus has always been on core strength, endurance, flexibility, and balance. It’s no surprise that her SURFSET® Fitness classes combine all four in fun, surf-inspired interval workouts! While Diana has surfed the Atlantic, Pacific, and Indian Oceans, you can usually find her riding her funboard at Long Beach, NY or Spring Lake, NJ. Diana’s SURFSET® Fitness classes bring the excitement of surfing to land, whether you want the rush of catching a wave, the lean strength of a surfer, or just a fun way to stay in shape. Aaron has always been a sport and fitness competitor and enthusiast. He developed a passion for surfing while attending college and pursuing a basketball career in Australia, and has never looked back. He combines the fun, free spirit of the surf lifestyle with the training regimen of a competitive athlete, and is a true believer in the fitness and spiritual benefits of surfing. Most importantly, he believes fitness should be as fun as surfing! Aaron has personally experienced the benefits of SURFSET® Fitness classes and the RipSurfer X since SURFSET® first launched in 2011. After years of working and studying techniques with trainers from various areas, he tried SURFSET® Fitness and was hooked. As a SURFSET® Brand Ambassador, Master Trainer, and co-owner of SURFSET® NYC, he is excited to share his enthusiasm for surfing, fitness, and coaching with the world. His motivation and focus on plyometric movements and core balance will have you in surfer shape in no time! Originally from Connecticut, Lauren's love for fitness lead her to North Carolina where she pursued a degree in Exercise Science and Psychology. Craving the buzz of a city, she landed herself back near home to NYC. She has been integrating fitness and wellness into corporate companies for the past two years. She offers health programming, personal training, group exercise, and yoga classes to help break the habit of sitting for long periods of time. The beach being her real true love, SURFSET® captivated her the first time she stepped into the studio. Suddenly the concrete jungle had SURFING! Becoming a Tier 1 SURFSET® Trainer, alongside being a 200hr Yoga Teacher, she soon realized she could fuse the two for a killer workout. Her classes fuse surf stances, yoga poses, and lot's of shark talk! Allison first tried SURFSET® Fitness while on her own weight loss and fitness journey. As soon as she stepped onto the Rip SurferX in her first class, she knew this was going to be the perfect addition to her workout routine. The challenging workout, and the fun, encouraging environment kept bringing her back for more. After regularly taking SURFSET® classes for years, Allison decided to earn her instructor certification and begin teaching SURFSET® classes. 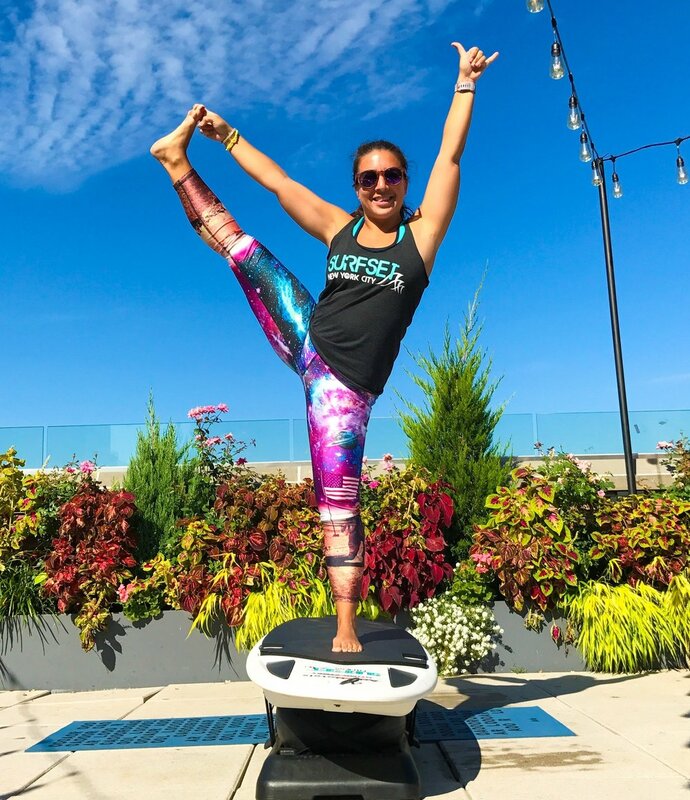 She takes her experience from training teenagers and young adults in team building and leadership as a summer camp director, and her enthusiasm and experience in SURFSET® Fitness, to create classes that are challenging workouts, and also a fun time. Born and raised in New York, sports and dance have always been an integral part of Gail’s life. She grew up playing several sports (basketball being her obsession) and then spent several years as a choreographer and back-up dancer. She combined her love of all things physical and now has over ten years of experience in the fitness industry. She’s presented at fitness conferences and conducted teacher trainings, both nationally and internationally. She’s been featured in a workout video, online fitness program, as well as The Fox Five Morning Show, Canada AM, Canada Home Shopping Network and the Dr. Oz Show. She teaches many different formats such as Pilates, strength training, hip hop, yoga, HIIT, Masala Bhangra®, TRX®, Bosu® and has specialties in sports conditioning and pre/postnatal fitness. Gail fell in love with SURFSET® Fitness when she found it incorporated the speed, agility and quickness needed for sports training, as well as the stability, balance and core strength of Pilates and yoga. As a NAUI Master Scuba Diver, the fact that it was ocean sports-inspired made it perfection. Gail believes fitness should be fun as well as functional. Her ambition is to inspire her students to achieve their fitness goals and become stronger both physically and mentally, on or off the board. Having been raised on the Beach Boys and Jimmy Buffett, Jen has always had a love for the ocean. Although her dream of being a Marine Biologist died after high school biology, she is an Advanced Open Water/Nitrox certified scuba diver and can often be found either at or dreaming about the beach. While her day job is in professional sports, fitness has always been another passion for her- she was awarded the Physical Education award in high school and also completed her 200 hour Yoga Teacher Training. Jen's introduction to surfing came through SURFSET® and as soon as she tried it, she was hooked. 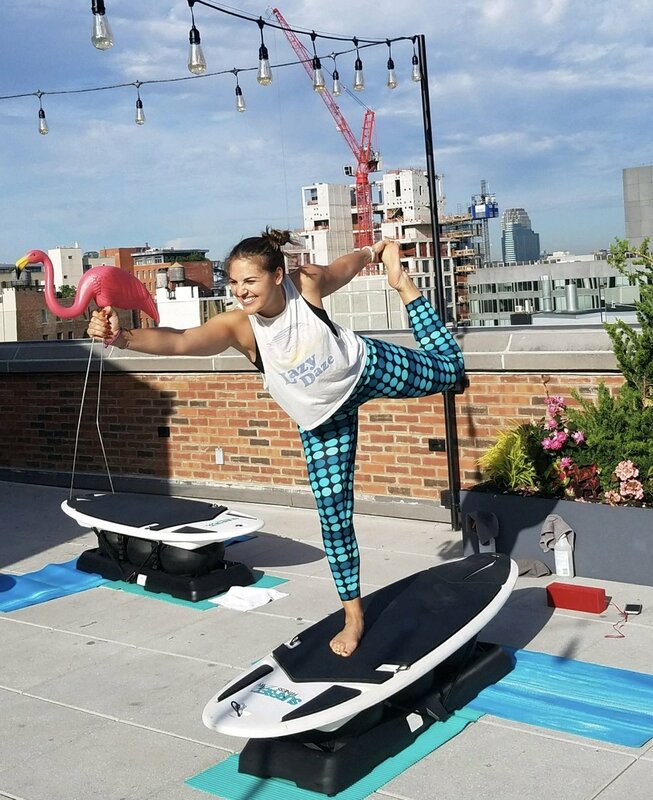 After taking the classes for a year, she became a Tier 1 Surfset Fitness Trainer and is excited to bring her love of SURFSET® and Yoga to SURFSET®NYC!